I wrote about the use of kuzu powder in the _goma dofu_ (sesame tofu) recipe. This time it's a very traditional, simple sweet dish using kuzu. Kuzumochi are sticky 'mochi' cakes made with just kuzu powder, sugar and water. The texture is somewhere in between gelatin and mochi made from rice flour - wobbly but not too sticky. It's traditionally served chilled, so it makes an interesting, gluten free (and vegan) summer dessert. Mix together all the ingredients in a small pan. It starts out as an opaque white liquid. Heat over medium-low heat, stirring consistently. As it heats up, it will start to clump up. Keep stirring. It will get more translucent and clumpy. Keep stirring quite vigorously. When it turns transclucent all over and quite thick, and clears the bottom of the pan, it's done. 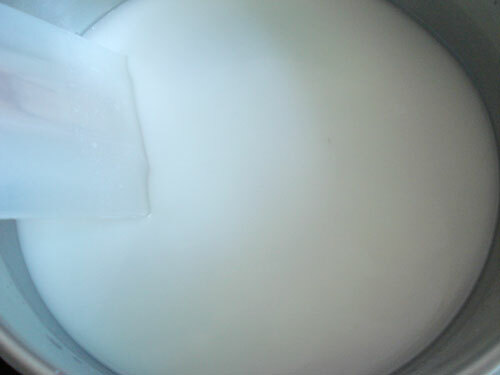 Wet the inside of a square container, and pour in the goo. Smooth out the top as well as you can with a wet spatula. It will be quite clear when hot, but will get more cloudy white as it cools. Let it cool down to room temperature, then refrigerate for at least an hour, or until completely cold. Take it out of the container (it will slip out easily) and cut into cubes. Since the kuzumochi is mildly sweet and quite bland, you can try all kinds of toppings. Try some fruit preserves, fresh fruit with honey or syrup, even condensed milk and strawberries. Submitted by maki on 2008-05-30 13:11. I've been thinking about making warabi-mochi for some time now. I think it's real similar to kuzu-mochi. I've already bought the warabi-flour and kuro-mitsu, but haven't made it yet since I was unsure of the process. Thanks for providing pictures, I think I'll give it a try this weekend. Love your blog, keep up the great work. I love your Japanese cooking and helpful info! Sincerely, a Japanese girl living in the mtns of So. Cal, USA. Mei, my instinct tells me that mitarashi sauce wouldn't fit too well, since the sauce is best when it's a bit warm, and the kuzumochi are best when they are chilled. But you could give it a try for sure! Palm sugar should be fine. Mother Bliss, warabi mochi sounds great! I wish I could get some warabi powder here. This seems an awful lot like the Filipino dessert, puto, but more gelatinous. Still, I bet they end up tasting fairly similar. Hey there, this site is fantastic! the way you describe the recipies are so easy to follow, especially with step by step pics!! A friend led me here and now I am an avid reader as I used to live in Japan and LOVE the food. The great thing about living in Sydney Australia is we can get almost everything here..
My mother is from the Micronesian island of Kosrae, which was governed by Japan before WWII. Now I know the origin of one the desserts they make for special occasions. 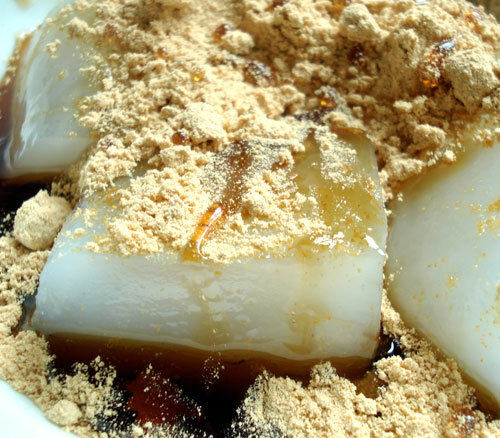 They use tapioca starch for a similar dessert and top it with a caramelized sugar and coconut milk mixture. I absolutly love preparing this dish. I think its the "goo" that makes it so fun for me. Your website makes me miss my mom's cooking! I can't wait until I go home in September, and she'll make me mochi and tempura and red bean/coffee gelatin dessert. She just got back from Japan a few weeks ago, and she brought osenbei and shumai and ramune MMMMMMMMMM!!! And those Hato cookies from Kamakura since she's from Ofuna. Can't wait to get home and show my mom all of these recipes. Your recipes rock! If you do open the cafe, be sure to drop me a note about it! Hi Maki, Ive been reading your site for a while and its been a bible for my bento and Japanese cooking XD Thanks so much for keeping this site and Just Bento they really make my day! I have a problem with my daaifuku/mochis T_T. 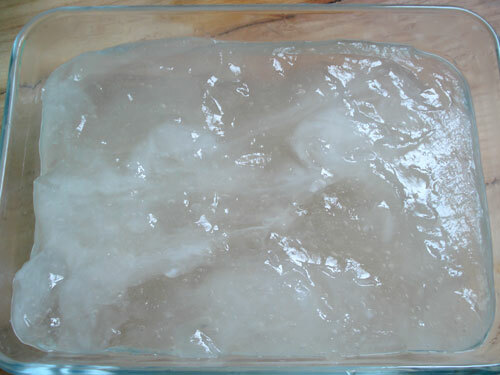 Ive always made mochi with chinese glutinous rice flour and the textures been fine but ive heard real mochi skin should keep in the fridge and freezer fine and should still taste ok afterwards but i couldnt do it with mine. So then I especially bought a pack of mochi flour from the Japanese grocery store labelled "mochiko" and tried to use it like many recipes have taught (cooking it in microwave with water and stirring until elastic, then cut and roll in cornstarch). 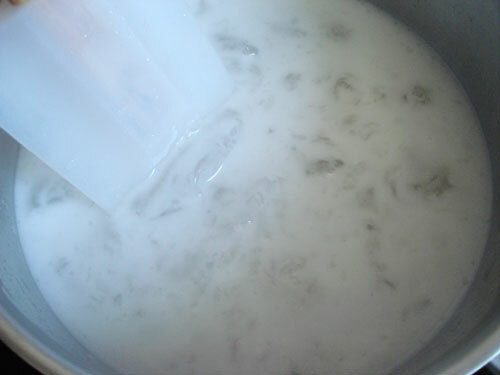 However, when i did, the flour texture and appearance ended up like the kuzu powder did; it was white at first then turned translucent and ended up jelly. I also noticed that the recipe on the packet the directions were exactly as what you have here to make kuzumochi (cooking it then pouring it in a pan to cool and cut into blocks). What is the correct flour to use for daaifuku? And what directions should i follow to make them? Should daaifuku skin turn transparent during cooking? 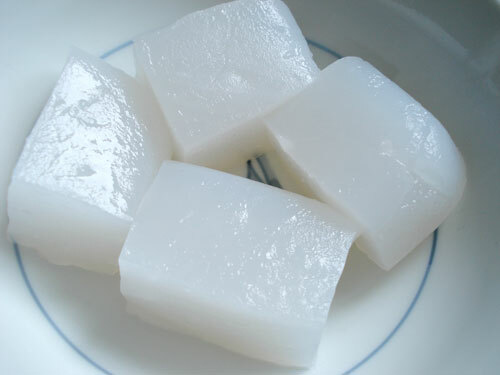 yannie, most Japanese mochi-based desserts are made with a dough called gyuuhi, or a variation of it. It's usually made with a mixture of medium-grain rice flour made from standard Japonica rice (the kind you use for everyday eating) called joushinko or joshinko, and short grain or sweet/glutinous flour or mochiko. 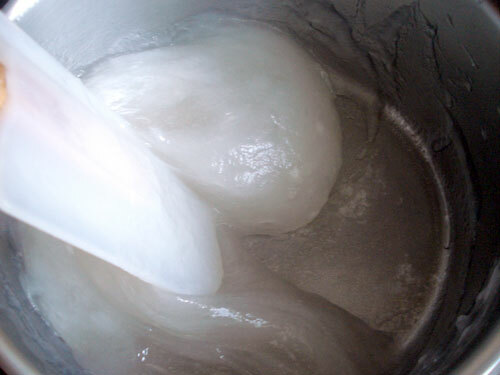 You can make daifuku dough with all mochiko, but you may have to adjust the amount of water. If you see the yatsuhashi dough recipes (there are two, one for all mochiko and one for a mixture of joushinko and mochiko. The consistency should be right for making daifuku. Rememeber also that daifuku gets its white appearance from a generous dusting of katakuriko or potato starch flour - you can substitute cornstarch for this. HTH! THANK YOU~for this easy recipe. Came out perfect and it was very easy to find all the Japanese ingredients. I am Lucky we have so many well stock Japanese supermarkets. ( LA~ OC Calif ). I made this for my Japanese friends and they loved it. Very very easy to make. I cut kuzumochi with a flower cookie cutter, it looked very pretty and was very tasty~ I have made a few of your desserts and never had a problem with any of the recipes. I lived in Kyoto for a few years and started to miss japanese desserts. The dango recipe posted on your site was so easy to make that most of my friends know all about the dangos from kyoto that were wrap in bamboo leaves~ once a month they eat some kind of dessert that I made from 'JUST HUNGRY" !! Thanks again for your generous time makind this site...this brings sweet memories from Japan!! I regularly read your blog(s) and I'm especially thankful for your detailed comments on Japanese cooking. Unfortunately as I tried to make Kuzumochi today the whole "dough" didn't turn out white/translucent but pink/brown and translucent. Is that ok? I think as it cooles the color will stay... Is there maybe something wrong with the Kuzu-ko I used? What do you think? At least, what I stole out of the pot did actually taste really good. So I hope it is just a problem of the colour. Hi Franzi, I'm guessing that the kuzu powder you have is not refined enough (is the powder itself white? It should be really snowy white). If it tastes good though it should be fine! Hi there! I live in Scotland it's proving very difficult to find Kuzu powder! When I google it, it often comes up with 'Kudzu' and it's often tablets it advertises! There are no asian grocery stores near me, is there a website you would reccomend buying it from? Also, are kuzu and kudzu the same thing? Thanks!